The 190go! Aluminum Tripod from Manfrotto a compact support weighing 3.7 lb that extends up to 57.5" high and folds down to 17.7". Utilizing twist locks, the tripod can be quickly set up and broken down with a simple twist of the wrist. The center column on the 190go! can be positioned at a 90° angle, parallel to the ground, allowing the tripod to reach its lowest height of just 2.75". An Easy Link adapter attachment allows instant connection between tripod and accessories, such as LED lights for macro photography and DSLR video applications using Manfrotto articulated arms and brackets. Box Dimensions (LxWxH) 22.1 x 6.3 x 5.4"
190go! Aluminum Tripod is rated 4.6 out of 5 by 38. Rated 5 out of 5 by Mr Wizard from A great tripod I use the Manfrotto 190go! for travel and quick day hikes. It is lightweight and compact, less than 23 inches long with an Oden BE-117T ball head attached. It features a slick center pole that can swing up, then over to 90 degrees for getting real low or for macro shots. It also has a built in 3/8-16 threaded port for attaching an extra arm to hold various accessories. The locking rings have a nice feel to them and clamp down with ease. Using it outdoors in the wind can make it a challenge when fully extended. Keeping each of the tripod sections only half way extended helps with that minor problem. I love the size and feel of this tripod, it can handle my Canon 7D Mk II and the 70-200 f2.8L-II-AF-IS with ease. Rated 5 out of 5 by SoFla360 from Light & Compact I debated getting this tripod over a less expensive Manfrotto power lock option. I wasn't sure about the twist locks, but I'm glad I went with the 190go!. It's quite light and compact and the twist locks work well. It's easy to twist multiple points simultaneously and extend the legs quickly and the same works in reverse. Converting to 90 degree angle is quick and painless unlike previously purchased tripods. My only concern is the plastic red centerpiece holding the main column in place. I'd prefer this to be aluminum, but perhaps it will hold up just fine over time. Rated 5 out of 5 by Jerry from I like this thing I had a tripod that I paid more for from a local camera store and it was always a pain to get the legs in and out. Cylinders were air tight and had air trapped in it. also the twist locks were a pain in the you know what. I had a ball head from same store and same manufacturer and it would not hold a D5200 with a 70-200 on it, without moving on me. I got a Manfrotto MHXPRO-3W head to replace the ball head. I liked it so much that I started looking for a Manfrotto tripod to go with it. This was on sale at B&H(only place I buy from now). The twist locks are close enough that with 1 twist of the wrest all 3 locks are released and setup is a snap now. I use this for time laps and landscapes in the wind all the time and with a Nikon D750 and a 200-500 f2.8 lens being my heavy weight setup and have no problems at all in rough country. Its a little heavy with the head and all but I pack this with me every where I go and I am in my 50's. don't leave home with out it. Rated 5 out of 5 by Ken from Very nice tripod! If you want a sturdy easy to use and versatile tripod the 190go is all that and more. It is not that heavy, the legs adjust securely and easily, and it looks great. I use it with an Oben BE-117 ball head, but you can use any head that suits you. I carry this in a backpack, ball head removed and in a cloth pouch to protect both items. I carry a couple bottles of water and a snack in the back pack as well, and it is completely manageable for long walks with my camera. This tripod replaces my original tripod from years ago that was much heavier and the legs slipped. I am happy with this purchase, and B&H shipped it quickly and it was professionally packaged and arrived in perfect condition! I like doing business with B&H, and I like this tripod! Rated 1 out of 5 by Ben from Legs Broke After 18 Months Overall, I?d rate this product 5 stars for use, stability, weight, and quality. However, after 18 month of pretty light use, more than half inside, the legs started to jam then fall out of the tubes. Very disappointing. I can?t give a product that costs this much, but breaks after that short of time more than 1 Star, no matter how well it works otherwise. Rated 5 out of 5 by MikeLTh from A Good hiking tripod This is a great reasonably light tripod. Sturdy enough for most photography uses while hiking. It is compact enough to attach to my backpack. The added weight is not a problem and the length is shorter than the pack. It supports my 7D MKII w/70 300L with no trouble. The twist to lock legs are better and more useful than expected. Rated 4 out of 5 by Anonymous from First Impressions! In my search for a new tripod, I found it difficult to find exactly what I was looking for. I wanted something light weight (<5 lbs), compact (<24), sturdy (able to support 10-15lbs), and versatile (able to get very low for macro but tall enough so I didn't have to hunch over)Basically I wanted it all, which is why I was very excited when I discovered the Manfrotto 190go!. It seemed to have everything I wanted, minimum height of 2.75, max height of 57.5 (w/column extended), load capacity of 15.4 lbs, weight of 3.7 lbs, and a length of only 17.7! All with a quality Italian build (I love Italian products!). However, it was newly released, and spending $ on something that had yet to be tested and reviewed was a little scary for me, because I love reading reviews! But I took a leap of faith, and I'm pretty happy I did! Hopefully I can help anyone else interested in this tripod make a more informed decision. So here are some first impressions after using it for a couple weeks:	I was initially impressed by the quality of this tripod. It looks and feels sturdy and well made. The rubber material of the leg warmer and twist locks is thick and provides very good grip. All the metal appears to be precisely machined to fit together perfectly. And it looks good too, especially the red accents! 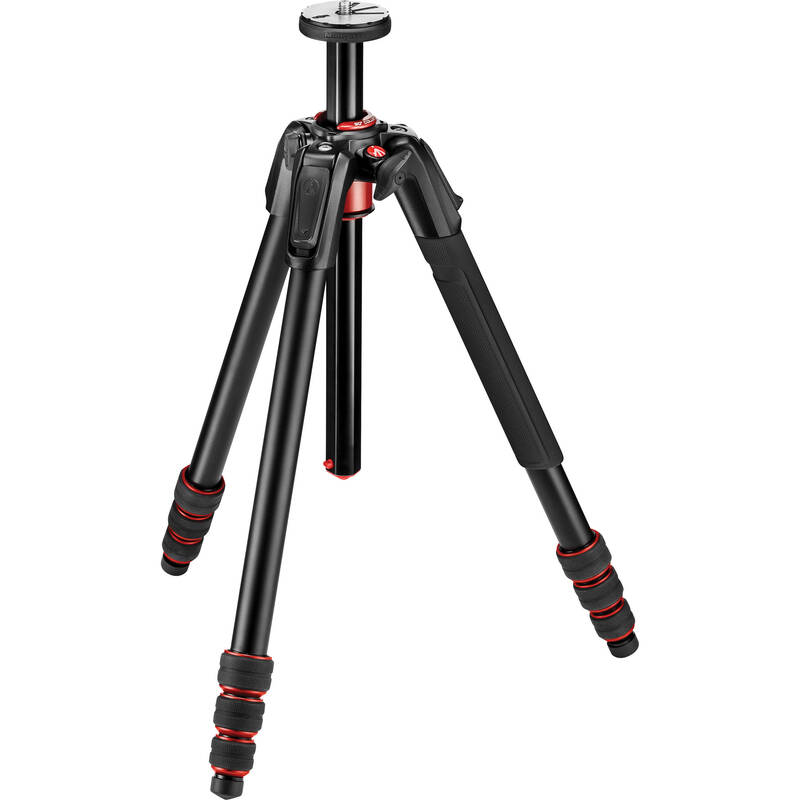 Manfrotto put a lot of good design into this tripod, and it shows. I had the chance to compare this with my sister's vanguard tripod (possibly the Alta Pro 263AB 100), and the difference is huge! The center column on the vanguard is so much more complicated to use. It requires adjusting several twist locks, pressing a couple buttons, and half the time the whole column would pop out! And there was a good bit of wiggle even after everything was locked down. On the 190go!, all you have to do is loosen the one twist lock, extend the column, push a button beneath the column, and voila! Instant 90 degrees! The only downside to this design is that you can only move the center column across the horizontal axis, but this is a worthy sacrifice since Manfrotto's center column actually tightens down very well in this extended horizontal position. One of my favorite parts of this tripod may be the twist locks, something I was initially unsure of. They are nice! One quarter twist unlocks all three locks, and a flick of the wrist fully extends the leg, which is actually quite fun! Some may not like the 4 leg sections, but I feel like this is the optimal compromise between compactness and sturdiness. A fifth leg section would be much too thin and unstable, while three sections would be too long for my taste. Maybe it's just my preference. These legs are very solid fully extended, and they only flex slightly when strong pressure is applied to the top, while individual legs will flex more when pressure is applied near the middle of the leg (I would expect most tripods with this many sections to have similar flex). It is nice that the legs can be adjusted to 4 separate angles (as opposed to 3 on many competitors). I will note that my legs were rather tight when they arrived. Changing the angle was pretty difficult at times. However, the screws which control this are conveniently located at the top of each leg, and a simple star bit allows you to customize to your liking (not sure if this was intended, but it works!). Some other welcome features are the Easy Link adapter, as well as a hook for attaching carrying straps or hanging bags. I also appreciate the extended 10 year warranty, which only adds to my confidence in the build quality of this product. Overall this is a very nice, well made and thought out tripod. I appreciate the premium quality and feel, and it is a pleasure to use after some learning and minor adjustments. With a ballhead attached, it is still very light and compact, and is of little hindrance to carry around (even when riding a bike!). You would actually have very little to gain by switching to comparable carbon fiber legs in terms of weight and size. Because it is so light and compact, I do not hesitate to take it along with me more often. But there are some cons. I wish it were a little cheaper ($ is a lot). It does not include any accessories, such as a carrying case, which it should for the price. I also find it somewhat annoying that I have to raise the center column to its horizontal position in order to get my camera anywhere close to the ground, but this is likely an issue with all tripods featuring a center column, not just this one. There are also a few plastic pieces which I question on durability. However, this is a great set of legs for anyone who wants quality, compact size, and versatile features. I give it 4 stars mainly because of the price, but it would be worthy of 4 if that were an option. ***If you do buy this tripod, there are some great accessories that perfectly complement this product! The Sirui K-30x is a solid ballhead with a quality finish, and it fits wonderfully on the top of these legs. If you want a carrying case, the Oben TB-20 is exactly the right size to fit this tripod with an attached ballhead. Rated 4 out of 5 by Daniel from Quality, but expensive I like this tripod a lot. I bought it to fit in a suitcase during an upcoming photo-heavy trip. The four segments in each leg and lighter weight material result in a tripod that is not as stable as a larger Manfrotto tripod that I got several years ago from B&H. But... this one is shorter when collapsed, has a handy hook for a weight, and a has a clever twisty gadget that flips the riser to horizontal (impossible to describe, you have to see it to understand it). My only complaint is that its expensive. If it lasts a few years it will be worth it but its too early to tell now.